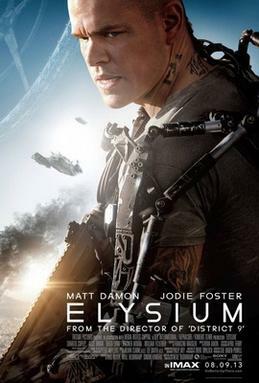 A couple of years ago, my husband watched the movie Elysium and told me that I should watch it. Of course I added it to my to-watch list, but as inevitably happens, I kept putting it off. Finally, this year, I made time to watch it, because I wanted to knock several scifi movies I had been putting off for some time now. I found that the pace of the movie was a bit slow. I understand that things need to be established, but sometimes I just wished that there was more action or other things to pick up the pace a bit. I did find it realistic feeling that in the future, as the world crumbles, it is the rich and privileged that escape to this paradise in space, leaving the poor behind. Yet, despite all this, they still seem to rely on those poor in ways, such as manufacturing robots. It makes total sense for this to happen. Even in the future, as we leave earth behind, the rich will still run things and make the poor suffer. I didn’t feel any real connections to the characters. There was a nice mix of different characters, but overall, I didn’t get that pull to root for certain characters like I would have liked to. As far as technology goes, which is often the best part of scifi, overall, I didn’t find too much in this movie to be unique. The medical beds that could diagnose and cure everything, at least it seemed like everything, was very intriguing. I mean, come on, that guy had his face blown off and a few seconds in a medical machine and boom he’s back to normal. Overall, this was an okay, borderline good, movie. If you haven’t watched it yet, and are thinking about it, I say give it a shot. There is a very good chance that people will enjoy this one. I was curious about this one, never did see it. I may check it out at some point. Thanks for reviewing it. You’re welcome. I feel like most people will enjoy this one.